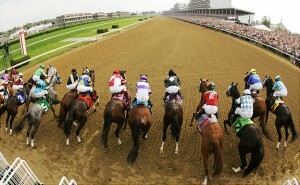 The Kentucky Oaks may take place under conditions other than fast. Race #11 – The Kentucky Oaks goes to post at 5:45 p.m. EST. There is a field of 13 going to post, and you may want to box-up two solid fillies. #1 – Joyful Victory (5-2) looks to be very hot right now. She exits off of two wins at Oaklawn, and Mike Smith loves his mount. She has faced the best early on in her career, and after that smoking bullet workout on 5/1 at 59.1 in the slop. I don’t think she has to have a fast track. I will be looking for her to get her picture taken on this day. Another that deserves respect, and should be boxed with her is: #6 – Zazu – (4-1). Ever since they have taken her to the main track and away from synthetic. She has shown a another gear. Each of her dirt races have been a little further each time out, and the two works at Hollywood show that she will have en0ugh gas in the tank. Derby 137 has offered more questions than answers. But, if you go back to the past running, this is nothing different for handicappers. Race #11 – The 137th Kentucky Derby goes to post at 6:24 p.m. EST. Rain is in the forecast, and April was one of the wettest months in history. Trainers have shipped in as late as possible. If the Racing Gods smile upon Louisville, track superintendent Butch Lehr will do his magic, and there will be a fast track by post time. Nick Zito knows how to ready a runner for this race as he has two wins to his credit. Julien Leparoux is no stranger to the winners circle, and he has the Derby locked in his sites. This was on his “bucket list” of races to win as he said on the Winning Ponies radio show. This colt by Mineshaft broke his maiden at Churchill Downs at two-years-old, and has had two 1 1/8 races under his belt heading into this race. His connections have kept him at Palm Meadows as long as possible, and is settling into Louisville just fine. Zito has his “New York cool” in full gear. It looks like he is enjoying the ride, and with a clean trip, his colt should give them fits. The one hole is no bonus, unless you are a drop back closer like this colt by Arch appears to be. Jinks Fires was our guest on the radio show, and along with his son-in-law Jon Court in the saddle are making this a family connection trip to the starting gate. His late charge in Arkansas drew plenty of attention. He looks to be maturing nicely, and has been working a good clip over the track where Fires is located 6 months of the year. Another son of Mineshaft looks like a freight train going downhill. There is no doubt who will be at the back of the pack, and you can bet he will be hoping for a fast track and a quick pace. Nakatani looks to get off the 0 for 12 snide, and this late bloomer can come flying late if the clock is honest. Steve Asmussen has had measured works, and is not known for sizzling the clock. His barn is like a controlled work, and he is getting the feel of his surroundings. If there is a bridesmaid for colts, it would be his prize. He was a neck shy in the Louisiana Derby and the Arkansas Derby. I would look for him to be a part of the exotics, and if the timer is hot, it could be his race to lose. If you doubt that, just go back and watch him digging deep in the Arkansas Derby. Others to consider: #16- Animal Kingdom who has been a turf and poly runner. he has an incredible turn of foot, and is training fine. #15 Midnight Interlude (10-1) has a good look as a middle pack stalker. He seems to relish a wet course, and his last work was a bullet in the slop at CD. But, this is where you will want to listen to the predictions for value. Winning Ponies does well on the big days, and with the rider/trainer stat additions this year, you have another tool to go even deeper to find that winning angle. Good luck, and enjoy the Oaks and Derby !